HOLD UP Knysna, The Cannon’s are in town! Formidable husband and wife triathlon duo, Michael and Lauren Cannon will be in town for the annual BIG5 Sport Challenge as part of the 2015 Pick n Pay Knysna Oyster Festival taking place from 4 – 12 July. The couple, who married in 2014 and have a 5 month old baby daughter Scarlett Mackenzie, will be in Knysna to take on some of the country’s top athletes in the multi-discipline event which starts on Saturday, 4 July and includes the 80km Momentum Weekend Argus Rotary Knysna Cycle Tour MTB Race, the Knysna Dragons Lagoon Mile Swim, the 14km The Salomon Featherbed Trail Run presented by GU, the full version of the Totalsports XTERRA presented by REHIDRAT® SPORT, and the 21km Momentum Cape Times Knysna Forest Marathon Half Marathon. Michael will be returning to the Garden Route town just a few weeks after competing in his first multi-stage mountain bike race, the challenging RECM Knysna 200. Indeed, apart from their daughter and their love of sport, Knysna is something they both share a passion for. Michael has also completed numerous Knysna Forest Marathons. It’s hard to believe that although they both spent so much time growing up in Knysna, the pair did not meet until they competed together in the East London Ironman 70.3 two years ago. “The highlight of my sporting career was winning my age group at Ironman 70.3 in 2013 and meeting my future husband on the top step of the podium,” says Lauren, who was a well-known South African triathlete at the time. Lauren Cannon, nee Dougall, was born and brought up in Durban where she made a name for herself as a swimmer when she was still a teenager and started competing in triathlons. She won her age group at the Ironman 70.3 event in East London in 2013, finished 2nd lady overall at the 2013 Knysna Forest Half Marathon, finished top 3 lady in the Tour Durban 105 km cycle race in 2013 & 2015, and has managed to beat Michael in a handful of local ocean series races in Durban over the last year, a feat which she is particularly proud of! Michael, who hails from East London and grew up in Gonubie, has been an avid triathlete and multisport enthusiast since the age of 25, which, he says, is considered to be a rather late start, but has worked hard to play catch up. He has won his age group at SA Duathlon Champs, SA Triathlon Champs, Ironman 70.3 in East London (2013 & 2015), has represented South Africa in both Triathlon and Duathlon, and recently ran his first full marathon in a time of 2:44, placing him 14th overall. “We are both always on the hunt for new challenges, wherever, or whatever they may be,” says Michael.  This will be Lauren’s second Big5 Sport Challenge and Michael’s third. “The first one I did in 2013 I was unable to finish because I’m a very soft athlete and pulled out of the XTERRA, due to the freezing cold conditions,” says Lauren. Michael says that after two Big5 Sport Challenges, he’s “hooked”. Despite the new challenges that having a baby presents, the couple manages to find time to train together. “We make a great team because I come from a swimming background and Mike from a running background so we are able to help each other,” enthuses Lauren. “The riding is one-sided however, with Mike pulling me on his back wheel at high speeds around the Durban circuits! “Being a triathlete and having Ironman 70.3 Durban around the corner in August has really helped my Big5 training as I have tried to swim three to four times a week at an average of 2,8 km per session, run a minimum of 50 km a week and cycle 180 – 200 km a week. The discipline I’m the most nervous of is mountain biking as I do not mountain bike at all but with a little crash course from Mike’s uncle Arthur with whom he partnered for the recent RECM 200 in Knysna, I’m sure I’ll feel a lot better. Says Michael: “We both live very busy lives, with work, family and other responsibilities, so our training is a nice break from the chaos of life. I love running. I’ve been running for years and love being out on the road, whether it’s during a race, or in training. I am also quite fond of cycling but I’m a roadie, so as far as expectations for the BIG5 go, I hope to be very competitive off-road and get a top 3 finish overall. It would also be amazing not to break any bones! “At the moment, I am training for Ironman 70.3 in Durban, so my base fitness is looking good. The Knysna RECM 200, a three-day MTB race was a great tester to see where I am on the mountain bike. Next Next post: It’s SHOWTIME! Let the games begin!